Angel Flight South Central, the Dallas chapter of a national organization providing humanitarian air travel, connects Dallas CASA volunteers with the children they serve all over the state. 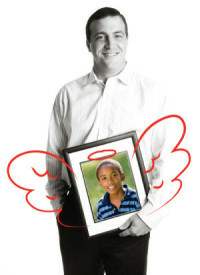 When a child is placed far away, Angel Flight will provide a pilot and airplane to fly the volunteer to that location. On any given day in Dallas County, more than 2,600 children are in foster care. Many of these children are placed outside of Dallas county, making it difficult for volunteers to reach them. For more information on Angel Flight South Central click here. In 2015, Comerica Bank launched the bank’s inaugural Prom Dress Drive benefiting Dallas CASA. The event was such a success, with hundreds of dresses donated by the community, Comerica continued to sponsor the drive each year and included Boys and Girls Club of Dallas as a co-beneficiary. During the month of February, select Comerica banking centers served as drop-off locations for new or gently used and cleaned formal dresses and accessories so that girls living in protective care and others served by the non-profits could experience the high school fun and tradition of prom. On two Saturdays in March, Dallas CASA’s upstairs advocate “treehouse” was transformed into a prom dress shopping boutique. CASA teen girls were invited to shop from a huge selection of dress colors and sizes. The boutique was complete with dressing rooms, mirrors and on-site alterations. In addition, gift bags of donated beauty products were provided and make-up artists and hair stylists helped with prom night beauty tips. We are grateful to Comerica Bank and thrilled to have their sponsorship for this event. Most children dream of finding special gifts under the tree Christmas morning. For children in protective care, life is so uncertain and full of change they can’t be sure Christmas is coming. But each child with a CASA advocate can be assured their holiday dreams will come true. Their advocate gathers their Christmas gift wish lists, along with practical things like clothing and shoes sizes, and submits it to Dallas CASA. Our very generous corporate and organizational partners then fulfill these wish lists, checking the lists off one by one. Gifts are dropped off at Dallas CASA’s offices and organized by member of our Children’s Council. As Christmas approaches, each advocate retrieves the gifts for their children and delivers the wrapped gifts, ensuring every child’s holiday wishes really will come true. To learn more or to engage your company or organization to become a 2018 Dallas CASA Angel, contact Sharon Balaban at 469-547-9455 or email. To learn more about our giving programs, please contact Sharon Balaban at 469-547-9455 or email.